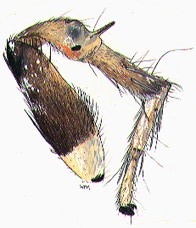 The H. viridipes group consists of those species with modified first and third legs that lack the secondarily straightened tegular apophysis characteristic of the H. coecatus group. Like the coecatus group, the viridipes group has a fringed first leg and modified third leg. (the placement of forticulus and velivolus is not clear). These two subgroups show distinctively different courtship behaviors (Maddison, unpublished). The viridipes group proper has a raised v of scales between the back eyes; the clypeatus group has a more prominent stridulatory organ. Some preliminary molecular data (Hedin and Maddison, unpublished) and aspects of the ornamentation hint that the clypeatus group may be more closely related to the coecatus group than to the virdipes group proper.